Hello everyone, I hope you had a great July 4th with your family and friends. I wore this striped dress to work today. I love it because it's super comfy and cute. This dress is really pretty! I love the stripes! Also, your shoes are just gorgeous! Following you! Love the colour on you, that dress looks really comfy too! Sooo effortless! anyway, just followed u thru gfc, maybe u want to check out my blog too? i love stripes! they are perfect any time even if it's not July 4th! It is a great dress, I could so imagine using it all throughout the summer =) Love the color as well, bright coral is so summer! 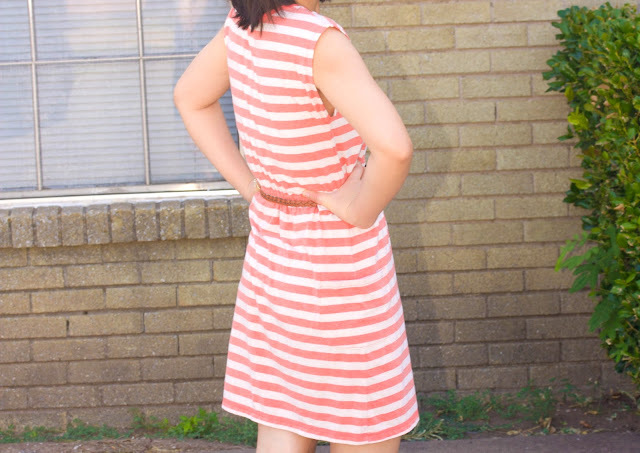 Nice casual dress, Love the coral stripes! Hey Tina...u look uber chic in this striped dress! !Perfect for a day out with friends or shopping!! Trendzy street Animal Print Bag Giveaway!! Following you Tina,Love from India! Super cute casual summer dress! Looks like a perfect "day at the beach" dress!! Cute little dress! Love this look. So simple and adorable. Classic. Love the coral stripes! I have a few pairs of Jessica Simpson shoes too, they are so comfortable and affordable! You look great. Lovey post. I have a new outfit post up, would love to know what you think! Nice dress! Follow you via bloglovin, maybe follow me back? ..great look , I love jersey dresses , they are so comfortable !